West Central Schools hosted the Annual Highway 34 Coalition meeting Wednesday, August 22nd in the elementary school cafeteria. The group meets annually to encourage local residents and area politicians to support the construction of a 4-lane section of Highway 34 from Monmouth to Burlington, IA. Kurt McChesney, as the Coalition Chairman, welcomed the good crowd in attendance for the hog roast. Most people came to hear the latest news and planning updates for the 4-lane project. Steve Staebell was the master of ceremonies for the evening's program. Mr. Jackson, District Engineer for the Iowa Department of Transportation, began the informational part of the meeting with an update of remaining projects still to be completed in the Iowa leg of the project to Des Moines, IA. Much of the Iowa project is completed. Illinois, however, is another story. Mr. Jack of the Illinois Department of Transportation outlined over $200,000,000 in various stages of the project from land acquisition to surveying, to completion of the proposal in several sections over time. 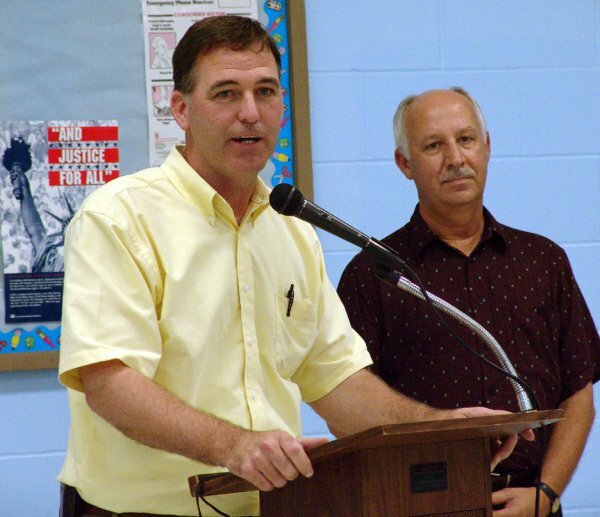 State Senator John Sullivan and State Representative Rich Myers (pictured) both were present to voice their support for this much needed construction project and their frustrations over lack of planning and funding from the State of Illinois. Both Sullivan and Myers urged those present to continue to keep the serious and extreme need of this project in the media and on the minds of anyone traveling this route through Henderson County. Mr. Ralph Grimm, Superintendent of the West Central School District, was among several leaders supporting the project. Grimm highlighted the safety concerns of the school, including the fact that a traffic fatality occurred this past spring immediately adjacent to high school property. All speakers reiterated the need for continuing support for the project from all interested stakeholders, including students and parents in the community who use Highway 34 for travel.